(Livescience.com) In the heart of Auburn, Ala., researchers have discovered a new species of trapdoor spider right under their feet, they reported Tuesday (May 8). 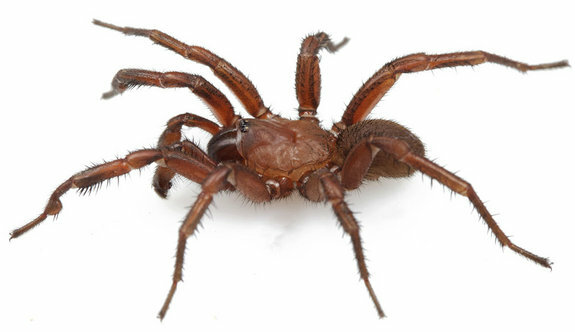 Named in honor of Auburn University's tiger mascot, the spider is now affectionately called the Auburn tiger trapdoor spider or Myrmekiaphila tigris. It belongs to the genus that includes among its now 12 species the famous M. neilyoungi, from Birmingham, Ala., named for rocker Neil Young. "The discovery of a new species in a well-developed area like this further demonstrates the amount of biodiversity on our planet that remains unknown," study researcher Jason Bond of the Auburn University Museum of Natural History, said in a statement. "We know so little about our home planet and the other organisms that inhabit it with us." Trapdoor spiders are close relatives of tarantulas and funnel web spiders, and look similar, though they have less hair on their bellies and legs that appear to be polished. The spiders craft underground burrows that they cover, as their name suggests, with a hinged door, though not all members of the group construct these trap doors. "Just as orb-weaving spiders make webs out of silk, these more primitive spiders also use silk, but not [for webs]," Norman Platnick of the American Museum of Natural History told LiveScience back in 2008 when he and Bond described the Neil Young spider. "They use it to line burrows, and an extension of the lining is part of the trap door." In addition to keeping out pests, the door allows spiders to ambush prey. When an unsuspecting insect or other prey walks across the door, the spider feels the vibrations and lurches from the burrow, pulling its now-bitten victim into its lair. Until now, scientists had grouped this trapdoor spider in with the species M. foliata due to superficial similarities. However, after closer examination, Bond and his colleagues found differences in morphology between the two. "The key differences were primarily related to differences in the male genitalia, modifications of the male copulatory device (the pedipalp), often used to distinguish among spider species," Bond told LiveScience in an email. Paired with genetic analysis, the researchers now say the two are separate species. "Despite the physical uniqueness of these specimens, the use of DNA as an alternate, less subjective line of evidence for recognizing the species was warranted, given our excitement with discovering a new species literally in our own backyards," Bond said. The spiders are just a few centimeters long, with females being larger and more "robust," Bond said. Males can be found in relatively large numbers wandering neighborhood sidewalks, in swimming pools and even in home garages between November and December, the researchers noted. That's when sexually mature males (at ages 5 or 6) emerge from their burrows on a mission to find a mate. Females are much more secretive, and longer-lived, spending their 15- to 20-year lives in their burrows, which are often more intricate with side chambers equipped with additional underground trap doors. The new species is described in the open-access journal ZooKeys.